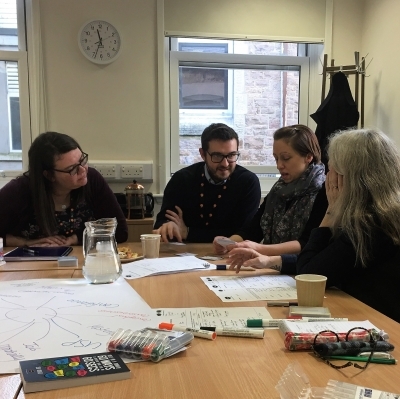 We recently ran a workshop for a group from the Welsh Language Development team at Gwynedd Council with the aim of teaching the team to deliver our Values Cards exercise, which they would do in Welsh! Our beloved Values Cards have been recently translated into Welsh so that this small group can deliver the fantastic two-hour exercise to students from Coleg Llandrillo on the 20th of February in Nant Gwrtheyrn. There, they will be hosting a day filled with activities designed to encourage the students to realise the importance of Welsh language and how vital it is to continue using Welsh as they enter the world of work. The Values Card exercise helps people identify their own personal values, the things that are most important to them, and then asks them to think about ways they do, and could, translate these values into everyday life. We have developed the Values Card exercise for this particular client group, introducing a second stage to the exercise which asks them to consider what values are integral to Welsh culture. This provokes a lot of discussion and debate about identity, language, positive and negative perceptions, and Wales's self-image. Ultimately it encourages belief and pride in Wales as a nation - just as the original, personal, Values Card exercise encourages belief and pride in the self. Get in contact with us about delivering training for your organisation at info@meee.global.